Opinions are like noses—everybody has one. The opinion essay is your opportunity to stare at your own nose for a while letting everyone else get a good, long look at it too. What’s great about having an opinion on something is that you aren’t obliged to support your opinion by facts or logic. After all, most of the time opinions are uninformed and irrational. But that’s okay—part of the point of writing an opinion essay is to see why we hold our opinions and how we justify them. After all, many of us maintain them on so many different issues without ever really knowing why. So writing an opinion essay actually lets you engage in some critical analysis. Think of the opinion essay as an opportunity to see whether or not your opinions are sensible or based on some kind of bias. In this article, we’ll look at all things opinion-related. We’ll give you some terrific opinion essay topics, an opinion essay outline, and show you how to write an opinion essay by following a few, basic simple steps. Let’s get started! Which style of leadership is best? Give your opinion on the kind of leadership you find most appealing. Back it up with examples of great leaders who represent that style. Golden Globes or Academy Awards? Which awards ceremony is more meaningful to you? Compare winners in similar categories and show why one or the other is more accurate at reflecting the best work of the year. Best artist in the world? Choose any artist—whether in music, writing, painting, drama, etc. Give some reasons why you hold this artist in the highest esteem. Greatest politician to ever live? Choose a politician from any era. Tell why this one is the best. Give your opinion and the reason you think it right. Whether you’re a fan of Aristotle or Kant, state your opinion. Explain how you came to have this view. Give your opinion on this topic. Analyze your opinion to see if it is fair and balanced. Do you prefer reading fiction works or non-fiction works? Why do you have this opinion? End the War on Terror? What’s your opinion on this War? Why should it end? Why should it keep going? Read up on what the Federal Reserve does. Give your opinion on whether it is time for this organization to expire. Whether you think Marx was on to the right idea or whether capitalistic society offers the better solution, explain your opinion on which economic system works best. Maybe there’s a third way you think would work? Share it. There’s nothing like a suit and tie to stimulate conformity. What’s your opinion on obliging students to wear a uniform? Another day, another mass shooting. What’s the solution? More restrictive gun laws, or more social awareness of the underlying problems that make people want to lash out violently in the first place? Nothing is more polarizing than the Trump vs. Hillary debate. State your opinion and explain why you would have supported one over the other—or neither! Free speech is one of the basic Constitutional rights in America, but today there are a lot of politics involved in terms of how we view this right. Give an opinion on how far free speech should be allowed and who should have the final say on the matter. You can vote at 18, serve in the military at the same age, but purchasing alcohol is off limits till you’re 21 in the U.S.
What’s your opinion on the drinking age limit? Is it necessary? Does it work? Why or why not? Overdiagnosed explains why health care professionals need to discuss certain facts about physical health with patients before embarking on a scan and treat program. Read the book and give your opinion on the matter: Are Welch et al. right or wrong? Does it work as a deterrent or have some other justifiable reason for being used? What’s your opinion on the death penalty? Provide a good reason for why you think it’s good or bad. Now that gambling on sports has been legalized, what impact will this have? Discuss your opinion on the matter and whether or not you think it will do more harm than good or vice versa. Should the 2-year degree be the new 4-year degree? Give an opinion on whether you think students should be required to take more or less schooling in order to get a diploma that they can use to get a good job. Consider a variety of fields and whether your opinion would apply in every case. Title: Should Americans Bail Out Pensioners? a. Hook: What to do about America’s starving pension funds? c. Thesis: If governments can’t pay their bills, they shouldn’t be making empty promises—and people shouldn’t be buying into them. a. The main problem with the pension plan set-up. ii. Americans were naïve enough to believe it could work. iii. The pension plan was an I.O.U. used to attract workers to the public sector—but the I.O.U.’s came due and those running the public sector still didn’t have the money. b. The plan was premised on bubble economics. i. When bubbles pop, investors lose their shorts. ii. Pensioners have lost a lot since the 2008 bubble burst. iii. The façade has been exposed for what it is, and now there are a lot of angry workers who want their retirement and the states simply don’t have it to give. c. Public workers thus want to be bailed out. i. That won’t work: tax payers won’t stick around for that to play out. ii. They’ll leave states that raise taxes—as they already are doing in places like California and Illinois. iii. Workers may deserve to be compensated since, after all, they were promised—but it’s partly their fault anyway for believing the promises. a. There’s no happy solution that will be a win-win for all. b. The reality of the situation is that the pension plan system cannot go on and it never should have been started. c. If states can’t fund the work, they shouldn’t offer the jobs. What to do about America’s starving pension funds? A lot of public school teachers and government employees all over the nation are more and more realizing that they promises made to them when they first started out on the job are not going to be kept. Why? The money simply is not there. Millions of Americans expect to be covered by their pension plans when they retire—and yet government officials are sounding the alarms, signaling that the pension funds are well short of the needed amount to pay out everyone’s retirement. In my opinion, the only thing to do is to pay out what money is left, apologize to the rest, and stop making these promises in the future. It won’t satisfy a lot of people, but the pension plan is a promise that never should have been made in the first place. The problem with the pension plan is that it is simply unrealistic. It was used as an incentive to get workers into jobs that were otherwise unappealing, low-paying professions with little to no up-side. People believed in the plan because most Americans are naïvely trusting of people in authority. At least they used to be (but after the pension plan debacle plays out, expect fewer and fewer people to trust anyone’s word on anything). Melville showed as much in The Confidence Man, a novel about a con artist who dons various disguises to prey on the good will of his fellow passengers. This was essentially the ploy of those running the public service sector. They knew they needed teachers to teach in their public schools and police officers to police their streets—the problem was how to get them on a limited budget. The solution was to basically write them an I.O.U. and promise them an easy retirement and worry free golden years so long as the workers put in x amount of years. The solution was a lie: those running the public service sector never had the means of paying out their retirees. Those running the public sector jobs put their hope in returns on investment. Stocks. Bonds. Emerging markets. Apple. Facebook. Bubbles, bubbles and more bubbles were blown courtesy of the Fed to help keep the Ponzi-scheme going as long as possible. But the 2008 economic crisis triggered the crisis point. The mask was pulled off; the emperor was shown to be wearing no clothes; the man behind the curtain was exposed—and public sector employees became furious. Now these same employees want to be bailed out—just like AIG was bailed out; just like the auto manufacturers and big banks were bailed out. One can’t blame them; after all, they put in their time and bought into the promise. At least, that’s what the kind half of me says. The other half says they were naïve enough to believe the lie, now they should live with the consequences. The money was never there. To expect tax payers to bail out the pension plan system now is beyond ridiculous. If taxes are raised, there will be a mass exodus from states—see California where this is already playing out. See Connecticut. See Illinois. In conclusion, there is no solution. The state will have to bight the bullet and the people who were promised the moon will have to find some other way to support themselves in their twilight years. It’s not an opinion that is going to make anyone happy—but it’s my opinion and I’m entitled to it, after all. Besides, if you want to be realistic about the whole thing, it’s the only opinion that matters. Everything else is just noise and more charades, and this country has had enough of both. It’s time to get real and time to throw the confidence man overboard. No more phony, empty promises. No more pension plans. No more public sector jobs if the state can’t afford to pay the wages and provide real incentives up front. It’s the only just way to do it, and it’s the only way forward. Yes, it will hurt. But it’s time to take the hit. Ever read the op-ed page of the New York Times or an opinion piece in a newspaper? If you have, you’ll notice there’s no one way to present your opinion. Some people prefer to use emotion when sharing their opinion. Others prefer to ground their opinion on research and facts. Others like to give an opinion based on some principle that relates to the subject. Opinions vary and so, too, do ways that you can go about writing an opinion essay. The best approach to take is the one recommended by your instructor. Most instructors will give students a rubric to follow or a guideline on how the essay should be constructed. It is important to follow these as closely and as best as you can. For all general intents and purposes, here are our recommendations for writing an opinion essay. When you write an essay, you want it to be focused. You might have a lot of opinions—but you’re only writing one paper, so limit yourself to giving one opinion. Pick a topic that you actually have an opinion on and know what that opinion is. Write it down. Look at it. Think about it. Then ask yourself: Why do I have this opinion? Answering that will serve as the meat of your essay. Our essay outline tutorial can help if you’re needing a bit more info on this step. If you know the procedure, you’re ahead of the game. Developing an outline is really all about just giving yourself a road map. It lets you see where you need to go so that your essay is complete. If you’re opinion is that Republicans are bad because you like jelly toast—you better be able to explain it. If you can’t, your opinion essay will stink to high heaven. With that in mind, it helps if your opinion makes sense. You can say something like: Student athletes should be paid because they make a lot of money for their schools. You opinion (the thesis) is defined and is backed up by a good reason. It’s always a good idea to have at least three main points to make. So whatever your thesis is (your opinion), try to support it with three good reasons, facts, or experiences that you’ve had. Remember, this is all about your opinion, so if you want to bring personal experience to the table, you’re more than welcome to do so. Also remember that this is not an argumentative essay, or a persuasive essay: it’s an opinion essay. You don’t have to convince anyone that your opinion is the right one—but you do have to explain your opinion and help your reader and yourself understand why you hold it. The hook is what grabs the reader’s attention. You can create a hook simply by asking a good question. Or you can make a bold declaration, or you can tell a brief story to get the reader interested. All of these methods work to capture the reader. Once caught, you can introduce your opinion on the matter rather easily and, even, it is contrary to what the reader holds, your hook will keep the reader going. Give yourself some room to understand why you hold the opinion you do. Even if you don’t exactly understand why yourself, you can at least explore this confusion and discuss some of the reasons you think you might have the opinion you hold on whatever subject your writing about. Make sure to give each of your supporting paragraphs a topic sentence that relates to your thesis. Follow your outline and you’ll be able to stay on track without wandering too far. Step 7: Create a strong conclusion. The conclusion is where you leave your reader with your final thoughts. You can summarize what you’ve already written or give a final perspective—a macro view on the overall topic that helps your opinion to make more sense. Acknowledge that others might not share your opinion and that there are certainly other ways to look at the subject, but re-affirm that your opinion is based on whatever supports you described in the body of the essay—whether you appealed to logic, facts, experience, or emotion. The most important part of writing an essay is the revision step. This is where you go back over what you’ve written and check for mistakes. Errors can occur in spelling, grammar, and in train of thought. Sometimes you’ll be writing and thinking faster than the words can be typed. When you go back to edit your paper for mistakes, you’ll come across a line that appears half-finished. Now’s your chance to finish it by completing the thought. Revision can make all the difference between an A paper and a C paper—so don’t forget to do it! Not everyone is capable of putting their opinions into words. You might have a basic idea—but getting it down on paper can be a bit beyond your reach. No worries! Our writers can help show you how to flesh out your opinion as if it were their very own. Say you’ve been tasked with writing an opinion essay on violence in the Middle East and have no idea what to say, how to start, and where to take it. Our writers provide people in your position with model essays every day of the year and can tackle your problem with skill and finesse. If you’re looking for help, try using a model essay to get you engine started. Order your opinion essay model today . Why do people want to know your opinion? Opinions tell us who we are and how we look at the world. The opinion essay writing exercise is a good way for us to look at ourselves and examine why we look at the world the way we do. What makes us hold the opinions we hold? What compels us to think about things as we do? Whether you rely upon logic and reasoning when forming your opinions, or whether they are based on experience and feeling, tell your reader about it. The opinion essay doesn’t have to be an all-powerful argumentative paper. It shouldn’t be. It should be a paper that gives you a chance to examine an opinion that you hold. In a way, it’s like taking a deep, long look in mirror of your mind and seeing what goes on in there. Yes, it can be scary. Yes, it can be daunting. Yes, it can be a struggle. But it’s worth it in the end. And, as always, if you need a little help—we’re always here for you. Clarify your opinion by explaining why you hold it. Don’t be afraid to delve into some of the more confusing aspects of your opinion—after all, that’s what this essay is all about: bringing light to your opinion. Hook the reader with a strong introductory statement! 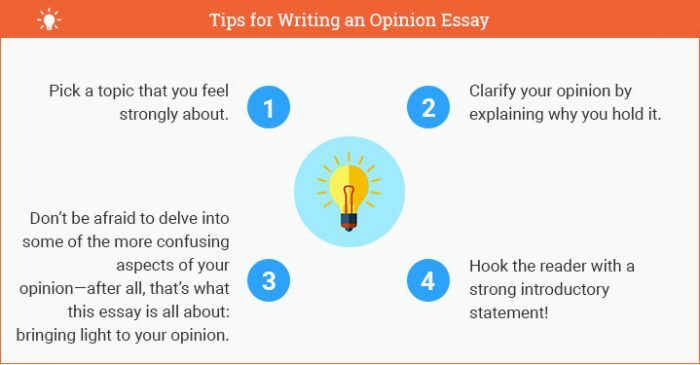 "How to Write an Opinion Essay (2019 Guide)." Aceyourpaper.com. Student Network Resources Inc, 19 May. 2018. Web. 18 April 2019. Student Network Resources Inc. "How to Write an Opinion Essay (2019 Guide)." Aceyourpaper.com. https://www.aceyourpaper.com/essay-writing/opinion-essay/ (accessed April 18, 2019).